MO961 Matte Black-Machined Wheel 20x9 94-18 Dodge Ram 1500 [Moto Metal MO96129055718 Wheel] - $249.95 : 3rd Strike Performance, Your Source for Late Model MOPAR Performance Parts and Accessories! Moto Metal offers a unique line up of stylish wheels to accommodate the growing number of 4x4 and truck enthusiasts who want a wheel that will set their rig apart from the rest. Gone are the days of having to run stock steel wheels or ugly off-road only designs on your truck. With Moto Metal you can choose from a huge selection of styles, sizes and offsets to give your truck, Jeep or SUV the perfect custom look. Based in California, Moto Metal uses high-quality materials to churn out their wheels and has styles to fit everyone's tastes from blingy chrome to more aggressive matte black. Whether stock, lifted to the sky or slammed to the ground, Moto Metal can accommodate your wheel needs. 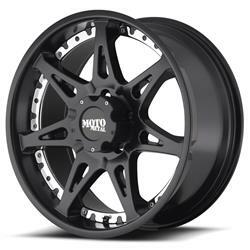 Moto Metal Series MO961 satin black wheels are made exclusively for the lifted truck and SUV enthusiast. They come with a really cool accessory--two sets of decorative inserts which attach to the inner ring between the spokes. One set is red and one is chrome, and the easy change from red to chrome is a really sweet feature. The cast aluminum construction features aggressive fitment and style, they are engineered using the top performance metrics in the wheel industry. They are available in a variety of diameters and lug patterns. Unique design characteristics, such as the six tapered spokes with each having a teardrop cutout for added style; give these wheels the looks, strength, and capabilities that the discerning off-road driver is looking for. Matte Black with Machined Accents, 20 in. x 9 in., 5 x 5.50 in. Bolt Circle, 5.710 in. Backspace, +18mm Offset, Center Bore 108mm/4.252 in.